Recently I was struck ill for the third time in six months with a particularly nasty flu virus. I had full-on congestion, fatigue and ear/sinus pain that was out of control. For the first few days I wrestled with reality, I hated my symptoms and I got stressed about all the things that I might not be able to do over the next week…. but as it went on (and on) I softened, I coped, I made peace. I was miserable, I cried, I sulked and I complained. Not my usual style, but I allowed my feelings to be felt fully and expressed in a safe and healthy way. Sometimes, life is hard. It's okay to be upset about that. Once I had sufficiently expressed myself, I practiced expansion with my difficult feelings. It's hard to do breathe work when your nose is congested. Usually breath focus is my go-to technique but it just wasn't going to happen. In fact, drawing my attention to my blocked nose just made me feel upset about my situation, so I needed to try something else. I used the leaves on a stream and observing thoughts meditations to help me observe my thoughts and I also did some self-guided body mindfulness, similar to this pure awareness meditation. When illness forces me to stop working, cleaning, planning and just doing in general, sometimes I just don't know what to do with myself. There's only so much TV I can watch before I just tune out, but I found myself using my phone more and more during this time. If I felt as though I could manage talking, I would call my bestie for a chat. If I wasn't up for it then, I would send text messages and social media pm's and comments to friends. Not everyone would reply straight away, but when people did, I got to chat more deeply than usual, and pass the time too! Energy work has helped my body to heal time and time again. I often turn to spiritual healing when I'm unwell to help me to resolve any imbalances, to find answers and information that are not able to be observed on the surface and to clear anything that may be preventing me from healing faster. I'm grateful that although I have several healers in my life, as a trained healer myself, I'm able to work on myself - a bonus! Every day I would make time for a healing session and feel more connected and vibrant as a result. I'm a natural optimist. It's in my nature to look for the good in just about every situation, but this sickness wore me down. I'd already had it twice before so my patience was wearing thin and I started to spiral into disappointment and frustration. During the moments of negativity and despair, I asked myself, "how would you usually react to this situation?" and "what would you say to someone else in this situation?" and a brighter response would emerge within me. Part of remaining optimistic involved keeping many of my plans, clients sessions and bookings in place instead of cancelling them. 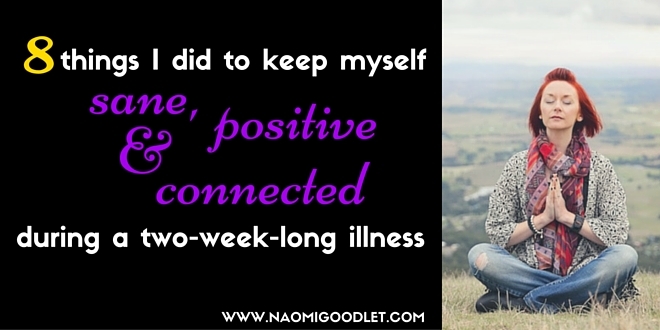 I let my friends, clients and class participants know that I was unwell and that I would make the call to cancel or reschedule items in my schedule at the last minute. Anyone who wasn't able to deal with a last minute decision got rescheduled and everyone else got on board with my positive thinking! When you're a doer, rest is often at the bottom of your list. I'm a compulsive doer. Even if I'm "relaxing" watching TV, I'm often also reading or writing at the same time. I haven't had much practice at doing nothing. I need to continuously remind myself that it's safe and acceptable for me to do so. In the past I've alway's pushed through and continued working despite my body's messages for rest, but not this time! If you're unwell (and even if you're not) bump resting up to the top of your list, and remember, it's okay to do nothing! As a fairly self-sufficient person, I often don't feel the need to ask for help and as a result, I get nervous about calling on the people in my life who are so used to me doing everything on my own. I had to remind myself that it's safe to ask for help and that there's no need to do it all right now. The first step to asking for help is to make sure that you have a clear solution in mind, when you do, it's much easier to delegate the task of achieving that solution to someone else. The second step is to surrender the process and avoid micro-managing. If you want someone to make you a cup of tea, then you have to let go of your attachment to how you make your own cup of tea. Let the person who is helping you take some ownership of the tea-making duty. Your job is to receive the tea with gratitude. The third step, if you're really unwell is to delegate decision-making responsibilities to someone who you trust. When your brain is slow and foggy, you're probably not in the best frame of mind to be writing a shopping list, choosing what to make for dinner or planning your child's birthday party. Yes, you can contribute to those things, but pass the big decision-making pressure on to someone else. You need to focus on getting better! I called on my partner, my friends, my family and even my 3-year-old daughter to help me with things that I would normally do myself, and it made a massive difference to my recovery. All of this openness, acceptance and positive thinking spurred from my Yes Quest - a personal challenge to make peace with my reality.